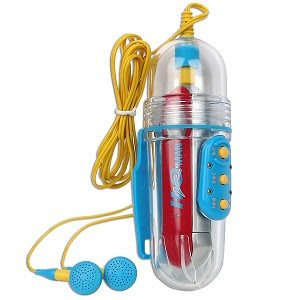 This is my underwater mp3 player called my H2OMan. I have been lap swimming lately and even when I am in shape I find long distance swimming very challenging to me. Needless to say now, I am far from in shape and need every little bit of help I can get. Enter 1 H2OMan into my life. It has a strap to attach to my arm, I put in my earphones and off I go. Lap after lap - jamming out my strokes to some Blondie, Indigo Girls and Boston. Sometimes in my back stroke I even sing along - much to the listening pleasure of the other swimmers, I'm sure;) Before I know it, my workout is done. Swimming takes me to my own little place in my own little world. I'm not staring at the backside of some super skinny woman on the treadmill in front of me wondering how many hours she spends at the gym to look like that. My thoughts are my own and my thoughts are about me. I find it such a therapeutic release of stress. And thanks to my H2OMan my lap count is forgotten.